August 13th 2016 a once in a lifetime experience took place at Ingøy and Fruholmen fyr – the world’s northernmost lighthouse. LULLELI for Fruholmen fyr is a choreographic celebration of the almost extra terrestrial landscape in western Finnmark. The Norwegian Landscape Theatre invited artists, a choir, musicians, children and locals to be a part of the LULLELI. 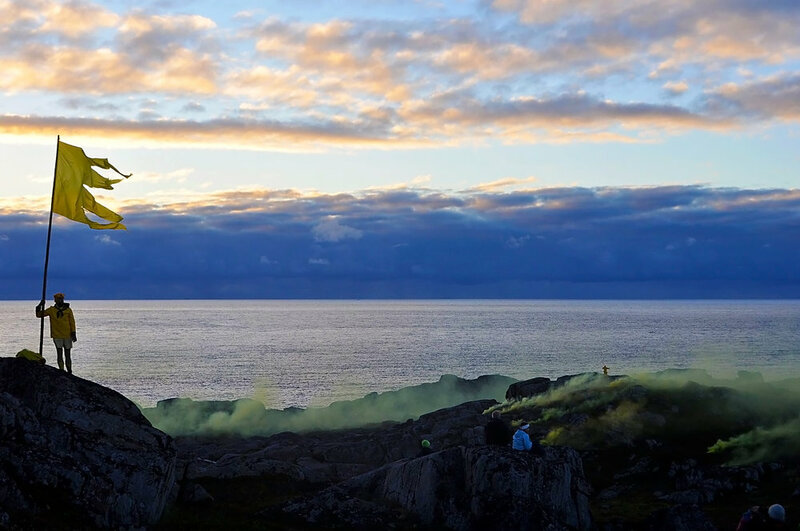 More than 500 spectators arrived by boat and experienced the transformation of Ingøy island into a landscape park full of artistic attractions and a big party by the docks. LULLELI for Fruholmen fyr made the impossible possible, and was a day to remember! The Norwegian Landscape Theatre are currently working on a book called “Lullelic Reflections”. LULLELI for Fruholmen fyr is produced by The Norwegian Landscape Theatre, consisting of Ingeleiv Berstad, Kristin Ryg Helgebostad, Tormod Carlsen og Eivind Seljeseth, in collaboration with Gulli Kristina Sekse, Fredrik Floen, Alf Ollett, Jørgen Knudsen, Elle Sofe Henriksen, Sara Baban, Cecilie Lindeman Steen, Zuzanna Skiba, Runar Bruteig Olsen, Måsøy kulturskole, Hammerfest Damekor, Hammerfest musikkforening conducted by Frode Sollie. Producer: Dansearena Nord – Maiken Garder, Anita Bjørkli and Susanne Næss Nielsen.